Bike to Work Day was a huge success! Here are some photos from the event. 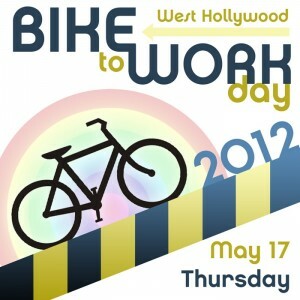 Bike to Work Day 2012 is right around the corner! The West Hollywood Bicycle Coalition is teaming up with the City of West Hollywood on 2 Pit Stops. Stop by on your way to work from 7am – 10am. The WeHoBC collaboration with the City of WeHo continues in May with the launch of West Hollywood’s “Watch the Road” campaign. Among posters developed for motorists and pedestrians, the City of WeHo collaborated with the WeHoBC on a poster geared toward cyclists. Like our Facebook page for an announcement on a poster tour ride and other Bike Month festivities – https://www.facebook.com/wehobike!